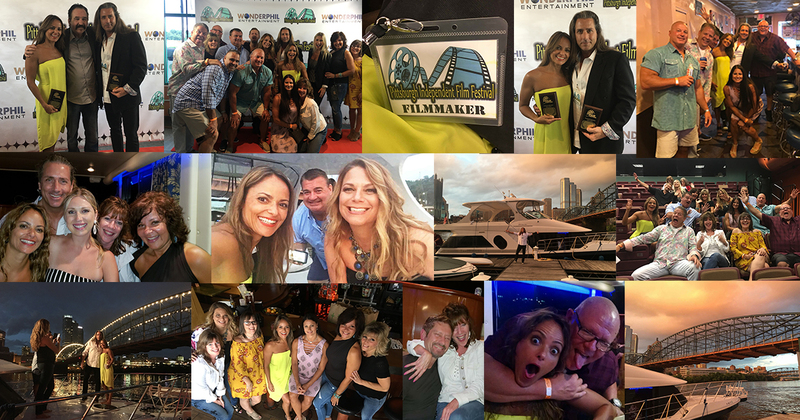 Blog From Hollywood to Pittsburgh, from the Screen to the Yacht! Candy & Ronnie team had a blast at PIFF! From Hollywood to Pittsburgh, from the Screen to the Yacht! Candy & Ronnie team had a blast at PIFF! The Strad Films dynamic duo Skyko & Lucy Macedo enjoyed a magnificent trip east, exhibiting their award winning short film Candy & Ronnie at the 9th Annual Pittsburgh Independent Film Festival! The filmmakers were able to attend the opening awards ceremony – only after a mad dash from the airport. Despite the unfortunate circumstances of Southwest Airlines temporarily losing their luggage, the filmmakers were still able to make it to the stage to accept actress Mair Mulroney’s award for Best Overall Performance for the entire festival! Congratulations Mair!! The team from Candy & Ronnie had the pleasure of mingling with many other filmmakers from a broad range of countries. The multi-talented actor / festival director Ronald Quigley did an amazing job of curating this years films with a diverse blend of engaging films from around the globe. Coco, the festival’s chief organizer saw to it that they were treated with kid gloves and made their experience one for the books, truly a welcome reception. Skyko’s closest high school friends filled the auditorium for the the Candy & Ronnie screening. Afterwards, they caravanned to Rob’s Yacht “Whatever USA” to crack a few bottles of champagne, motor out onto the three rivers and watch the sun slowly set over Pittsburgh’s majestic skyline. Check it out pictures of their fantastic evening of true friends beyond family and their NEW family at the Pittsburgh Independent Film Festival!